WinFOLIA Basic is our entry level low cost solution for leaf analysis. This version mimics the functionality of portable leaf area meters. It measures the leaf area, length and width in a simple manner as done with those devices (in the horizontal and vertical directions), perimeter, holes area and some other measurements (see table below). WinFOLIA Regular has all the Basic versions measurements plus some morphological measurements that are specific to leaves. For example, it can differentiate the blade from the petiole so that you can choose to have the petiole included or not in the measurements of area and length. It can measure width in different ways and lobe angles also. This version also has more features like the possibility of adding observations, doing user defined interactive measurements and a few more. WinFOLIA Pro has all the Regular versions measurements plus some extended morphological measurements (such as Fractals) some of which are specific to leaves (envelope - convex hull, teeth...). This version also has color analysis that can be used for disease, necrosis and insect damage quantification. The Reg and Pro versions can measure the area and length of the blade and the petiole separately or together (as a whole). All versions can produce total and average leaf area (for all leaves in the image) as well as individual areas (per leaf). 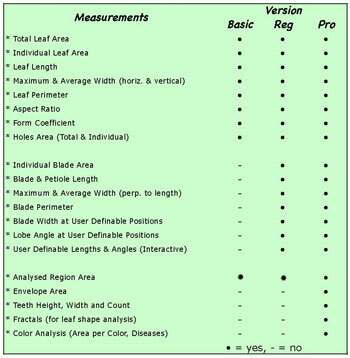 All versions can measure the leaf perimeter (blade+petiole) but only the Reg and Pro versions can measure the blade perimeter without the petiole. The Pro version measures the area of any object manually simply by tracing it in the image. Leaf or blade Maximum Length and Width can be measured in different ways. The simplest method is the one used by hand-held leaf area meters and is available in all versions of WinFOLIA. Leaf length is measured as the largest distance between the highest and lowest points belonging to the leaf in the vertical direction (on the same vertical line) and width is the distance between the leftmost and rightmost points in the horizontal direction (on the same horizontal line). Length and Width can also be measured as the vertical and horizontal size of the leaf bounding box (distance between the leaf leftmost and rightmost boundary points), but unlike the above method, these do not have to be on the same line. Average width is the average of all widths measured along the leaf. With the Reg and Pro versions, Length can be measured as the distance between the apex and petiole-blade junction (any orientation close to vertical) and Width as the largest width perpendicular to blade length. These versions can also measure width at two different positions that you specify along the blade length. Aspect ratio is the ratio of horizontal width to vertical length (it is sometimes called elongation factor). Form coefficient is a numerical value which grade the leaf shape as between circular (shortest perimeter for a given area) and filliform (longest perimeter for a given area). Total and individual holes areas. Holes completely inside the blade (enclosed by it) are automatically measured. Those on the edge of it must be manually closed with image edition (as illustrated below) to be measured. You can fill the hole with a different color or close the blade edges boundary. Blade lobes angle can be measured by the Reg and Pro versions at two different positions along the blade length. Interactive user-definable lengths and angles allow to define custom measurements (that WinFOLIA cannot do automatically). As an example, it can be used for measuring veins angle. The envelope is the length of a line that goes from tooth to tooth on their apex. The area covered by the envelope can be measured by WinFOLIA Pro. Teeth height, width and count. WinFOLIA Pro can quantify the area per color, measure its dominant one and classify objects in function of it or other criteria (it can classify a leaf as diseased if the diseased color group has the largest area or is larger than a percentage that you specify). The leaf color classification can be seen on screen. Colors of interest are specified to WinFOLIA simply by clicking the image. Pixels of the image are classified into classes in function of their color. Classes can be grouped in order to measure areas with more than one color (for example diseased area may contain brown and yellow colors). The classification is done by true color analysis in 24 bits color space and not using a simple color threshold as in some other leaf analysis programs. Note: For color analysis without leaf morphology, see our WinCAM program. Image edition allows to modify the image content to remove artifacts, debris or, as illustrated below, to fill in holes. You can choose the color to edit with by picking a color already present in the image or define your own. In this example a damaged leaf boundary is closed with image edition using the pen tool so that holes on its edge can be measured automatically by WinFOLIA. In this example a damaged leaf area is filled in brown using image edition with the brush tool (a lasso is also available). Drawing a region the same color as the leaf allows to include it in leaf area while drawing it a different color allows to measure it in the holes or background area. An observation is a mean of adding measurements not programmed in WinFOLIA or to indicate irregularities observed during measurement. A simple observation could be something like: Is Damaged. Although WinFOLIA is optimised for leaves, it can also analyse the area and shape of other objects such as foliar disks. For morphology or color analyses of generic objects (other than leaves) see our WinCAM program. Debris filtering is available to prevent small particles, such as dust, from being considered as leaves during automatic analyses. Objects with an area larger or smaller than specified values can be removed from the analysis. Batch acquisition optimizes speed and minimizes operator intervention during the image acquisition process. 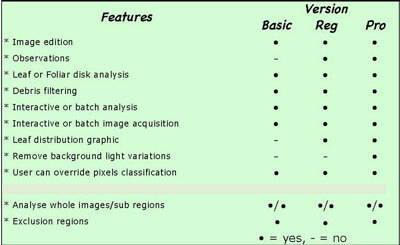 Batch analysis allows to analyse series of images without operator supervision. Note: Not all measurements can be done in batch. View during the analysis the leaf area (or other morphological parameters) distribution into classes that you choose in a graphic above the image. You can also view the color area distribution (Pro version). Background light variations occur when lighting is not uniform, a problem that is encountered with camera based images not with scanners. These variations can cause some wrong pixels classifications. A function is provided to minimize or eliminate them but is effective in laboratory situations. It is more efficient and better to eliminate light variations using proper lighting techniques during image acquisition. The Pixels classification is the separation of image pixels (picture elements) into the leaf and background groups (a prerequisite for accurate measurements). This process can be done automatically (with user validation using different methods in function of the WinFOLIA version) or manually. If there are wrong classifications in some image areas, the operator can override it interactively by first selecting that area (outlining it) and changing the classification parameters. Some features can be more easily detectable (have higher contrasts) in a specific color channel (Red, Green or Blue) of a color image. This channel, rather than all of them, can then be used to make the pixels classification and the measurements. The possibility of analysing only a part of the images adds flexibility (Pro version). It allows to select specific regions of interest to be analysed and to ensure that only leaves are analysed (no debris, text written close to leaves or objects other than leaves). These regions can have any shape (circular, rectangular or any irregular shape made with the lasso tool). Similarly, you can define regions to be excluded from the analysis. Analysed and exclusion regions can be resized, moved and recreated (to analyse the same region over time or for different images. Data produced by WinFOLIA are saved in standard ASCII text files. They can easily be opened by statistical or spreadsheet programs such as Microsoft Excel. The analysis settings are saved with the measurements data (useful to make verifications or quality control on the measurements). Furthermore, when an image is saved to a tiff file after it has been analysed, the analysis is also saved in it and when such file is later opened from WinFOLIA, the analysis is recreated as it was at saving time. WinFOLIA comes with printed color manuals which are abundantly illustrated. Like all of Regent Instruments products, it is backed with prompt and competent technical support by email (messages are typically answered within one hour when they are received on working hours Eastern time America). WinFOLIA is updated regularly to add new features or simply to keep it on par with new operating systems as they become available. WinFOLIA has a companion program called WinSEEDLE for conifer needles and seeds analysis. Both programs can share the same image acquisition hardware (you must specify it at purchase time). A rebate is offered when both products are purchased together. WinFOLIA and WinSEEDLE are members of a family of products sold by Regent Instruments for plant science research and analysis. Among the other products you will find WinRHIZO for root analysis and WinDENDRO for tree ring analysis. See our web site for more information. XLFolia, an optional software program to help classify and visualize data produced by WinFOLIA. It is made as a set of macros that runs in Excel (2010, 2013 or 2016). These macros add a new menu (named XLFolia) to Excel's menu. The latter contains commands to process data and create graphics very easily. Excel's standard commands remain available allowing you to do your own processings and graphics.